In recent years, there has been a rapid increase in the use of ball alleys, custom built walls etc to improve the skills of hurling. Conventional Sliotars deteriorate very quickly in such use, which led to the development of the "Wall Ball". 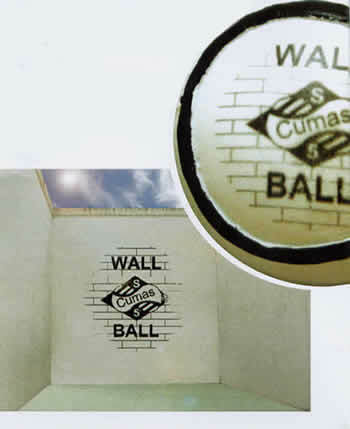 "The Cumas Wall Ball is ideal for use in modern 'Hurling Wall Training' for individuals or squads"
Moulded in a special polyurethane, the Cumas Wall Ball simulates the feel and performance of an ordinary sliotar with the advantages of economy and excellent durability.